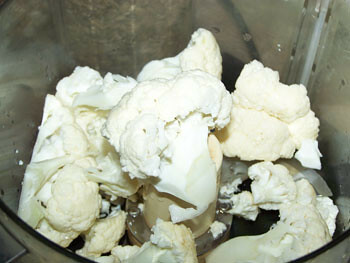 Pulse cauliflower florets in a food processor, place into a large mixing bowl. 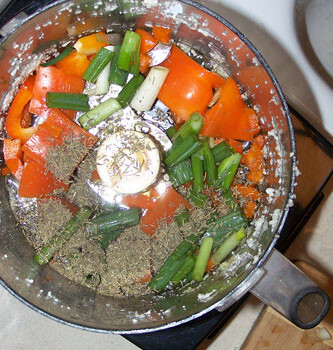 In the empty food processor bowl, add the oil, large pieces of orange pepper, large pieces of scallions, thyme, and cayenne. 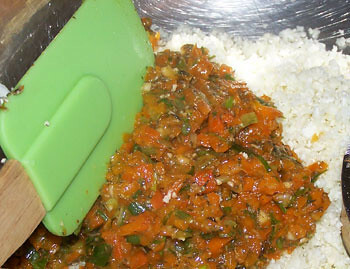 Pulse until finely chopped.Stir mixture in with the cauliflower, adjusting salt, lemon, and cayenne to your liking. Serve immediately. 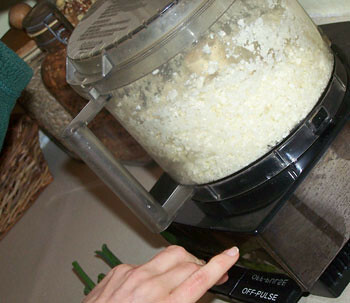 Cauliflower doesn't stay fresh very long once it has been processed. Please note that this dish is supposed to be on the spicy side! It was delicious and exactly what my body was asking for. I added a lot of the cayenne and my mouth was on fire (but I enjoyed it! ).This dish is festive and tasty. Let me know if you try it! wow... next time try a fractalflower ... I like the fact that you made it spicy! Hey, everytime I've had mashed cauliflower, it's been something someone else made days ago and it turns my stomach to think about it. Now that you mention that it doesn't stay fresh long, I think I should try it again, eating it quickly. Thanks for the tip and the recipe. To start me onto mashed cauliflower gently, do you or your readers have a favorite that tastes much like the mashed potato? Your recipe looks yummy, I'm going to make it today! I have weeks of cauliflower cravings a few times a year too! Wonder what's in it that we crave!? Here's a video I did recently with cauliflower, (it's video #18 on the list) at http://www.reneoswald.com/videos.html Hope you enjoy it! Parsnip half and half with cauliflower makes a more "like mashed potato" dish to me. We love cauliflower soup and make it almost weekly during cauliflower season. We even put it in thermoses for trips. 1 head = 1 1/2 quart thermos fulls, so we make 2 batches and fill up 3 thermoses. It is so nice on road trips. We haven't tried getting it through security at the airport. This will explode if you leave it in there and wait too long. Ask me how I know! one time when she ate it the second day and it gave her a tummy ache. pepper if you like, too. mostly I just trust that my body knows what's best and just go with it. I watched your cauliflower video--I liked all the greens you ate it with. I can usually tell by ingredients if I will like something, and boy, I printed this baby out as soon as I read everything...only I didn't have the cauliflower on hand. So I substituted broccoli floweretts only. Although it was quite tastey I needed something more, so I had one of those small italian pizza shells on hand and warmed that up and put this recipe on top and ate it that way. I always have a hard time with these chopped up things because I want to eat it atop something. That was my solution tonight, but I am sure it would be great on italian flax crackers too. thanks again, this recipe is definitely a keeper! p.s. read your 3/10 blog. Wow! you are one committed family. Many Blessings to you. don't mind (and actually enjoy) eating the blended foods by themselves. and crackers is to eat the dips/spreads on sliced cucumber or tomatoes! 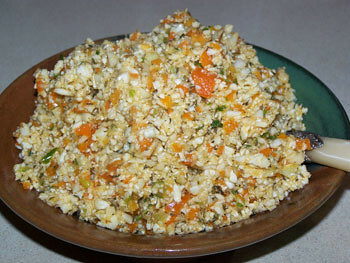 I made your CauliFest a few days ago and enjoyed it SO MUCH!! Thank you for sharing your recipe ~ YUM!! it! Yay!! I love hearing from others when they try my recipes! Raw Couliflower is The Best! I tried it last week and I'n a fan of it! This recipe is amazing! I took it for lanch today! I'm so glad you tried it!! I am still into cauliflower a lot. I mostly just blend it up, but this recipe was very tasty! I have a bone to pick with you(pardon the expression!). You said to serve immediately, because cauliflower doesn't last too long, but, can I tell you something? I made this and ate some wrapped in nori sheets and dipped in shoyu-delicious. There was plenty left over so I put it in the fridge and the next day I thought it tasted even better. Following that, I still had more thereafter, and, long story short, I have kept this refrigerated for over a week and to me, it seemed to just taste brilliant the longer it sits-up to a point, that is-the point being roughly two weeks. I've even frozen it, and when it thaws it gives off quite a bit of juice, which I mixed with shoyu sesame oil, garlic, ginger, etc, and the remaining mixture is even dryer and better for sushi rolls. This is one of my stand-by's , a truly magnificent recipe that I will always use. Thank you for your very clever concoction! Very versatile, and a raw classic in my book!